A tart sipper for a warm fall afternoon. Combine sugar and water in a pan and bring to a boil. Add thyme and steep until cool, then pass through a fine strainer. 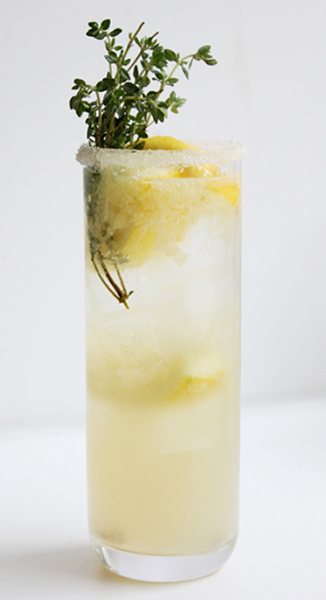 Combine 1 1/2 oz thyme syrup with 1/2 oz lemon juice in a shaker; shake for 10 seconds. Strain into an ice-filled Collins glass. Add soda water to taste and garnish with a sprig of thyme. Notes: This fall-infused lemonade is perfect on its own, but if your Friday afternoon is calling for something a bit stiffer, a splash of vodka wouldn't hurt it one bit. Cheers!